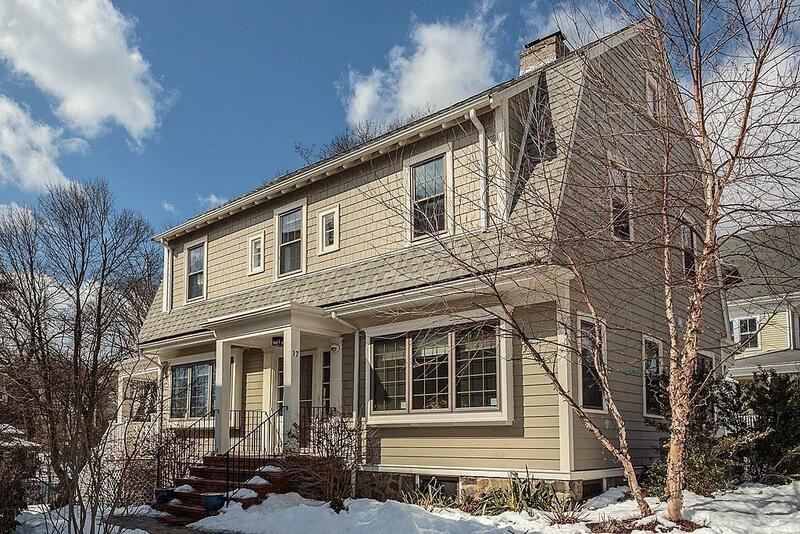 Nestled on one of Arlington's loveliest streets sits this tastefully renovated Gambrel Colonial, boasting spectacular views of Spy Pond & the Boston skyline. Be greeted by a gracious foyer, relax by the fireplace in the LR with beamed ceilings, ample built-ins. Bring the outside in, w/ two sets of restored french doors leading to a welcoming covered porch.Chefs will delight in the renovated kitchen, w/ stainless appliances & large kitchen island.Dining room w/fireplace& beautiful oversized windows frame views of the pond. 2nd floor features 3 ample sized bedrooms with period built in storage & laundry.Serene master bedroom includes walk in closet, luxury bath, & office space with spectacular views. 3rd floor loft 4th bedroom/playroom. Hardwood floors, updated roof, and systems, irrigation system. Access to boat launch on Spy Pond by way of private steps from terraced & fenced in yard. Short distance to the Bike Path & shops/restaurants in Arlington Center.Close to Rt.2, and major routes.